Dress plain and regular Chee Cheong Fun or Steamed Rice Rolls into a meaty Asian treat by adding some delicious chicken floss and seaweed for an extra crunch. 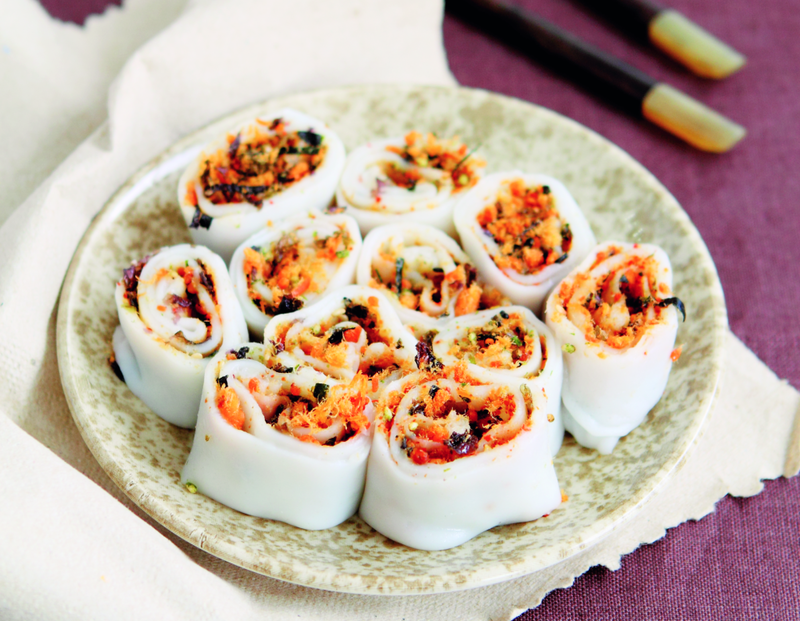 To prepare this chicken floss and seaweed rice rolls recipe, you’ll first need to look up the recipe for basic steamed rice rolls, and fragrant soy sauce. Mix all together and store in an airtight jar until needed. Follow the recipe for steamed rice rolls. After you have swirled the batter around the pan to coat evenly, sprinkle chicken floss and seaweed mixture over the rice sheet, cover and steam for 5 minutes. Remove from pan and roll as per recipe. Cut the stuffed rice rolls into segments and serve with fragrant soy sauce poured over.